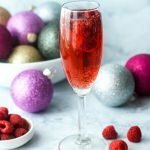 This low carb holiday raspberry mimosa is the perfect drink to sip on Christmas morning or New Year's eve. Lightly sweet and easy to make you will want to drink them all year round. In a champagne glass or flute, add a few raspberries. Brew your tea using twice the amount of bags and let cool in the refrigerator until ready to use. Add the syrup or sweetener of your choice to the raspberry tea and mix well. Pour in 2 oz of raspberry tea and then follow with 2 oz of champagne. You can substitute sweetener of your choice instead of the sugar free raspberry syrup. Use as much as tastes good to you.